Jupiter’s intense northern and southern lights pulse independently of each other according to new research using the European Space Agency’s XMM-Newton and NASA’s Chandra X-ray observatories. Dr Caitriona Jackman, Associate Professor of Space Physics at the University of Southampton, contributed to the study, published in Nature Astronomy. The study, led by William Dunn from University College London (UCL) used data from a Chandra Space Telescope campaign proposed by Dr Jackman. The study found that very high-energy X-ray emissions at Jupiter’s south pole consistently pulse every 11 minutes. Meanwhile those at the north pole are erratic: increasing and decreasing in brightness, independent of the south pole. “Jupiter’s auroral X-ray emissions are the most powerful in our solar system, and their study provides unique insight into the origin, dynamics and acceleration of charged particles in the Jovian magnetosphere,” said Dr Jackman. “Now is a fantastic time to study Jupiter, as the Juno spacecraft is taking high resolution in situ measurements of the magnetic field and particles which can help to constrain our theories of what causes the powerful X-rays. “Jupiter is a fascinating environment for astronomers and planetary scientists to study,” Dr Jackman continued. “It is easy to spot in the night sky with the naked eye, but powerful telescopes (including those such as Chandra and XMM which work in X-ray wavelengths) can unveil ever more detail, including these dynamic auroral X-ray hot spots. Lead author William Dunn from the University College London Mullard Space Laboratory, said the research team didn’t expect to see Jupiter’s X-ray hot spots pulsing independently. It was thought their activity would be coordinated through the planet’s magnetic field. 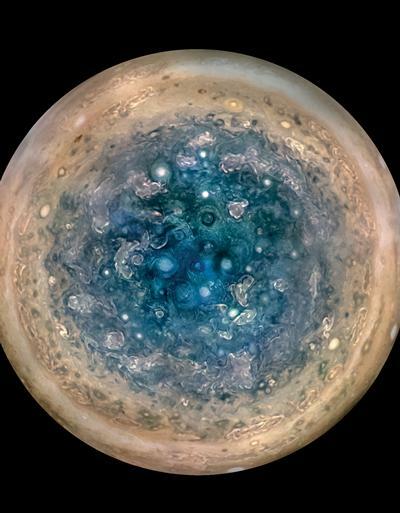 “We need to study this further to develop ideas for how Jupiter produces its X-ray aurora and NASA’s Juno mission is really important for this,” explained Dr Dunn who is also associated with the Harvard-Smithsonian Center for Astrophysics in the USA. “If we can start to connect the X-ray signatures with the physical processes that produce them, then we can use those signatures to understand other bodies across the Universe such as brown dwarfs, exoplanets or maybe even neutron stars. It is a very powerful and important step towards understanding X-rays throughout the Universe and one that we only have while Juno is conducting measurements simultaneously with Chandra and XMM-Newton,” said Dr Dunn. Click here to download the paper ‘The independent pulsations of Jupiter’s northern and southern X-ray auroras’ (DOI10.1038/s41550-017-0262-6, Nature Astronomy).